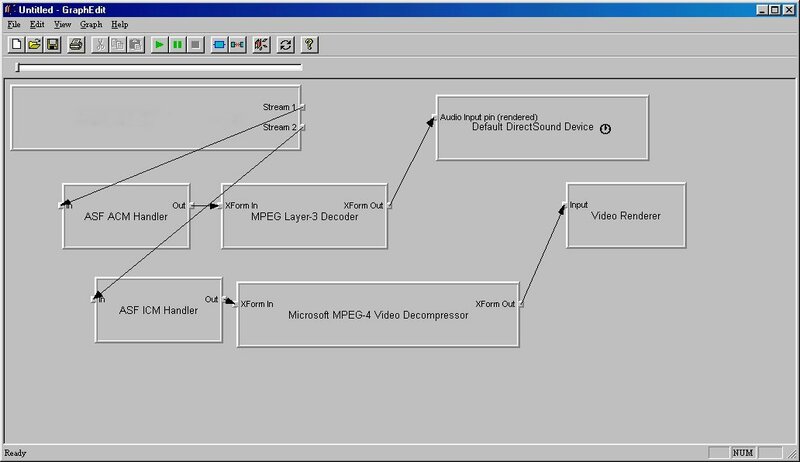 GraphEdit is a graphical tool to video conversion. It allows you to see exactly what is going to be converted to what. I dont pretend to be an expert using it, it is quite difficult. GraphEdit was part of DirectX SDK 8.1, as it was part of the SDK I dont believe there should be any problems re-distributing it. I use GraphEdit to convert WMV and ASF files to AVI. I still have no idea why companies (naming none) dont decided on an open standard. Sorry wrong place, back to GraphEdit. Its complicated and I really dont have time to document everything, all I can say is have a go, if you have problems the Search. Its not the nicest UI but it works.